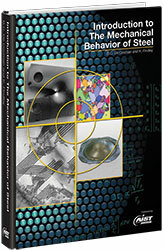 Prof. Bruno C. De Cooman of Materials Design Lab just published a new book "INTRODUCTION TO THE MECHANICAL BEHAVIOR OF STEEL". steel, load-bearing capacity of construction steel, fatigue life of axles and bearings, and risk assessment for the fracture of line pipe steel. The book emphasizes approaches that can be applied in engineering practice. Steel mechanical behavior includes a diversity of strengthening mechanisms, and the fundamentals of strength are illustrated by means of practical applications.